As a passionate skincare junkie, I have toyed with multiple face creams. I have spent years alternating between an intense moisturizer, a brightening treatment, and a retinol cream. But I’d never been able to treat my myriad skin concerns with just one product. Until recently, when I tried this Eladi hydrating Ayurvedic face cream from Kama Ayurveda and it completely changed the game for me. This super nourishing Ayurvedic face cream does it all – from deep hydration to plumping fine lines to brightening dull complexion – I wake up feeling soothed and radiant! 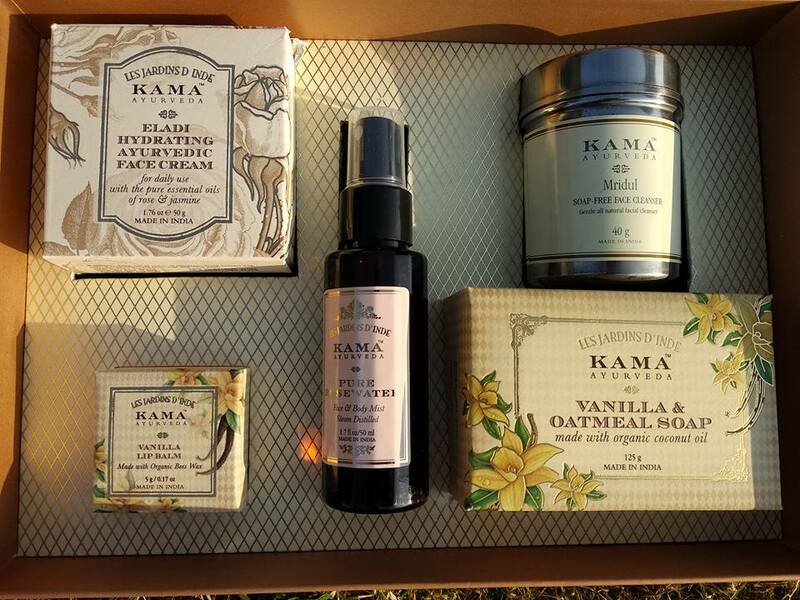 It came to me as one of the contents packed in Kama Ayurveda Signature Essentials for Her gift box presented by my husband on our last wedding anniversary in December. But I however, got to use it only recently, when my face started scaling like a snake due to the new retinol I was using. Any other product/products by the same brand tested by me? “A nourishing Ayurvedic day cream that moisturizes, softens and protects for soft, smooth and clear skin. Made with a blend of pure ingredients, this formula is prescribed in the ancient Ayurvedic text of Ashtanga Hrudayam as the ideal skin treatment of herbs processed in pure Coconut Milk and Sesame Oil. Costus and Cardamom are known for their Varneekarana properties – the ability to enhance skin texture. Costus is especially known for its soothing effect on skin. Also contains Aloe Vera which has antiseptic properties, prevents acne, blemishes, fine lines and gives adequate sun protection. Roughly all skin types except acne prone oily skin. Best suited for winters, dry, dehydrated, sensitive skin types. Not suitable for summers or hot humid weather conditions. Aqua, stearic acid, cetyl alcohol, DC 3021, coconut extract, olivem 1000, rose & jasmine essential oil, vetiver, shorea robusta powder, sesame oil, nutmeg, Indian rose chestnut, cinnamon, cedar wood powder, cardamom powder, phenoxyethanol, panthenol, allantoin, xanthum gum, aloe vera juice, EDTA. Mineral oil, parabens, or any other harmful chemicals. Possibly acne/allergy/trouble causing any ingredients? Rich emollients and essential oil blend present in this cream may cause acne in certain skin types. How’s the texture and color? Texture is thick and creamy and the cream is soft-white in color. My first thought was like – “omg! – it’s so heavy – it’s going to take ages to absorb”. But fortunately, it got absorbed quickly and blended easily! Elaadi hydrating Ayurvedic face cream comes packed in a luxe brown coloured glass tub. The tub packaging looks royal and traditional. While, I tend to avoid tub packaging due to the fact it involves digging fingers into the cream each time you intend to use, making the whole process unhygienic. So I totally admire the fact this cream’s tub packaging accompanies a small cute looking wooden spatula meant to scoop out the cream from the jar without putting your dirty fingers in. The only con here is that the glass jar packaging makes it inconvenient for travel purposes. Scoop out a pea sized amount from the spatula and massage the cream all over your face and neck using your finger-tips. While, the cream is meant for day time use, I use it as a night cream mainly for two reasons: first, the cream doesn’t contain any spf and second, it is intensely moisturizing so works great for overnight nourishment and hydration. Best suited for winter season. Use it in summer only if you have extremely dry, dehydrated skin. How long have I used it? A whopping INR 1125 for 50g! Anything, but it all needs to go under this, as this face moisturizer is too thick for anything to penetrate through it. This rich facial moisturizer has rescued my skin. There’s really no two ways about it. I started using retinol at the start of this year to battle the signs of aging that have now began to show on my face. The mistake I made was, I started using it daily. As a beginner, retinol is advised to be used for not more three or four times a week and gradually as your skin starts getting accustomed to it, you can build up the frequency from every other day to finally every day. ‘Haste only makes waste’ – now no one knows that better than me. My skin suffered greatly due to my haste. About only a few days of using retinol, my entire face turned red and started peeling. It also attempted to initiate dermatitis around the corners of my mouth and on my chin. It then hit me to take things into control before I’ll have to seek professional help from a dermatologist. I immediately stopped using retinol, cut back on all chemicals, cosmetics and other skincare products – used only plain water for washing my face in the morning followed by aloe vera gel as moisturizer for day time use, increased my intake of vitamin C, and for evening skincare, used this Eladi Hydrating ayurvedic face cream as night cream. Within a few days of this regimen, my skin healed completely. And now after two weeks of diligently using this Ayurvedic face cream, my skin is glowing and supple as if nothing happened. The best part about this cream is that it’s made from totally natural ingredients which are not only good for your skin but also for your overall health and wellbeing. The aroma too is calming and soothing. What’s bad about this cream? A whopping INR 1125 for just a facial moisturizer, Kama Ayurveda Eladi hydrating ayurvedic face cream is quite costly. Secondly, the glass jar packaging isn’t travel-friendly. Thirdly, it’s intensely moisturizing and a bit greasy, making it unsuitable for oily skin and summer season. And finally, it doesn’t contain any spf, so you have to use a separate sunscreen, when using this cream for day time. 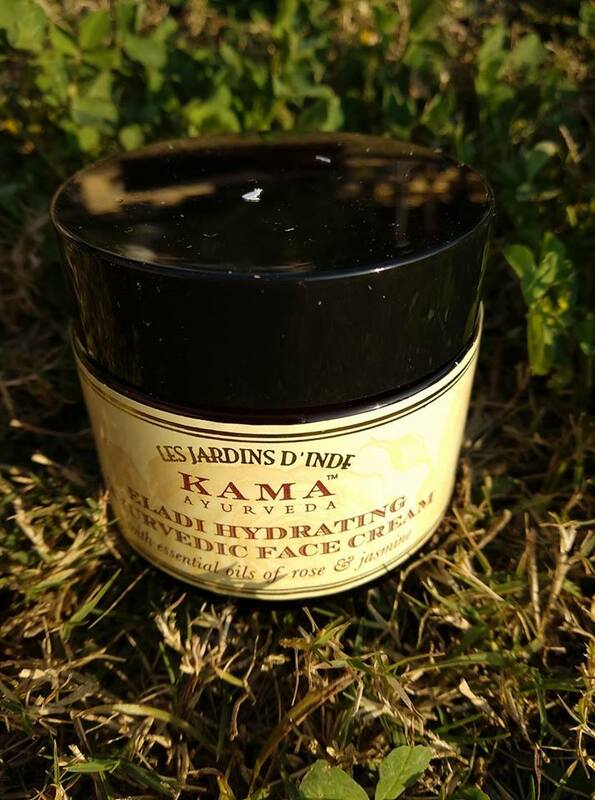 Kama Ayurveda eladi hydrating face cream is a great chemical free moisturizer enriched with the goodness of rich essential oils. The cream is best suited for dry skin and winter weather. If you feel your skin is unusually dry, sensitive or damaged by chemicals, this ayurvedic facial moisturizer is a must try.